Humans first started hanging out with dogs about 30,000 years ago, according to scientists, making canines the oldest domesticated animal. Dogs were by our sides when we invented the wheel, developed agriculture, and discovered antibiotics. In today’s world of technology, it’s no wonder that dogs are right there with us, also benefiting from our newest inventions. Now you can use technology to help care for your dog, no matter his age. When my pup, Mookie, was younger, I bought him some brain games to keep his mind occupied. Brain games are essentially simple puzzles that dogs have to figure out in order to get the treats hidden inside. Some brain games are simple and perfect for young puppies under 16 weeks. Once a pup gets older, he needs a more complex game. When Mookie was 12 weeks old, I got him a brain game with sliding disks that conceal a treat in a corresponding hole. Mookie likes to use his paws, and it didn’t take long for him to figure out how to push each disk aside to get to the treat underneath. When Mookie hit 17 weeks, he needed something more challenging. We got him a toy made up of three hanging beakers covered with lids punched with holes. The dog has to move the beaker in just the right way to get the treat to fall out. Mookie was a little afraid at first, but once we showed him how it worked — and that treats came out — he overcame his fear and began trying to figure it out. 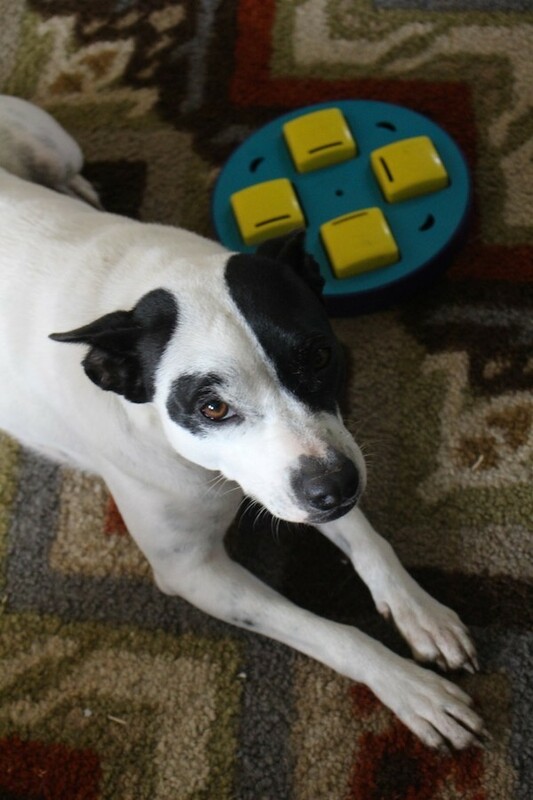 For Mookie, a half-hour session playing one of these brain games had the same effect as a 30-minute game of chasing a tennis ball. He would be mentally exhausted and fall fast asleep. Adult dogs can be left alone for longer periods of time than a puppy, usually have less energy, and spend much of their time alone napping. If you’re going to be away from home during dinnertime, an automatic feeder can help. I’m not talking about the kind of feeder you fill up with food and let your dog graze the entire time you’re gone. Those don’t work if you have other pets you don’t want to get into your dog’s food or if you want to control your dog’s portions. You want an automatic feeder that provides your dog with a pre-measured amount of food at a specific time of day. Automatic feeders can be programmed to open only when you want them to. While it’s not a good idea to leave your dog alone for days at a time, some feeders can be programmed to provide food for more than one day. You can take advantage of this feature to provide small portions of food to your dog more than once a day — a good idea if your dog tends to eat too fast. Although automatic feeders weren’t designed to dispense medication, if you have only one dog, and she needs medication at a certain time of day, you can set up an automatic feeder to dispense that special pill. Of course, this only works if your dog is willing to ingest medication that has been wrapped in a piece of cheese or a Pill Pocket. Thanks to technology, you can keep close tabs on your dog even when you’re not home, especially if you have an older dog with health issues who needs regular monitoring. Apps you can view on your phone help you keep an eye on your dog from just about anywhere. With most of these apps, set up your laptop computer so the camera points to the area where your dog spends most of his time. The app live streams the image to your mobile phone so you can check on your dog throughout the day. When my Corgi, Nigel, was recovering from cancer surgery and was at risk of having a seizure, we were afraid to leave him alone. We used an app called iCam that allowed us to watch him when we left the house for a couple of hours. We even had a chance to have dinner with friends one night a few days after his surgery — a welcome stress reliever after all we’d been through. I checked my phone every half hour to see how he was doing. The peace of mind was well worth the $4.99 price of the app. 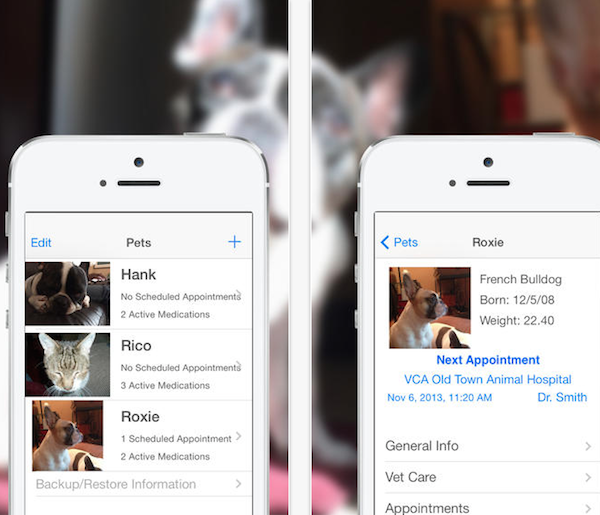 Another app is out there to help you take better care of your senior dog. Pet Phone for iOS can help you track your dog’s medication, vet appointments, pet food, weight, vaccinations, and other important stuff. It’s an easy way to keep everything organized in one easy-to-access place. The post Tech That Helps You Care for Your Dog, No Matter Their Age appeared first on Dogster.